I do like Halloween, not just because you can go by people’s houses and get candy. I like the dress up aspect: to be someone or something different for a day. 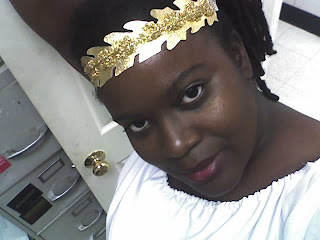 Although I have a thing for vampires, the Halloween outfit that was the most comfortable for me was when I dressed up as Athena, the Greek Goddess of Wisdom (I dig that), Crafts (sure thing), and War (well, um, only when necessary). I also like the horror movies, too. I tend to look at a lot of them during this time, too. When I was a kid I loved Halloween. When else could you walk down the street and knock on someone's door and get a bunch of chocolate candy?!? I've never been a fan of Halloween or dressing up, but I've always admired others for wanting to do that.